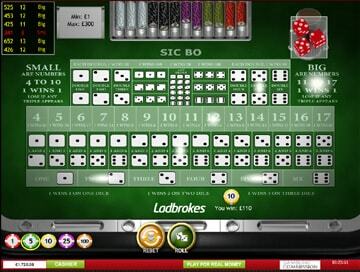 The game below is a Flash (NO download) version of Sic Bo from Spin Palace, which you can play for FREE, without registering. 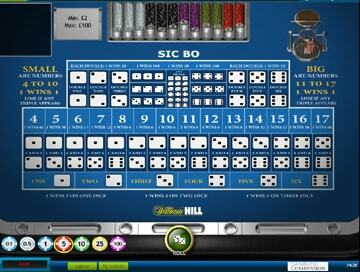 Sic Bo is a fast-paced, exciting, three dice game, loved by Asian gamblers worlwide. Not that common in Western casinos, in Macau you'll find rows and rows of Sic Bo machines, with players furiously placing their bets. At first glance, the board can look quite complex and intimidating, but it's essentially very simple to play. 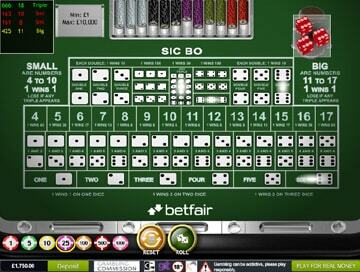 Once you understand the board layout and your betting options, you'll be playing in no time! 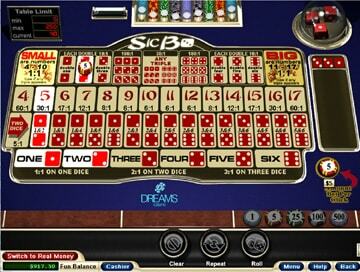 Sic Bo is a fast-paced, no-nonsense game that appeals to fans of both Craps and Roulette. Winning strategies for online Sic Bo. Sic Bo has strategies to suit all styles of gamblers: even money bets for steady gamblers, decent returns for more adventurous punters and massive combination bets for high-rollers! What are the odds of winning at Sic Bo? We explain the odds, probabilities, house edge and payouts for each Sic Bo bet.